I vaguley remember reading something many, many years ago about Franco Sbarro and his cars. I had forgotten about them until I saw this. From what I can gather, the Challenge started off as a 2 seater based on a 911 chassis. At some point, one (?) 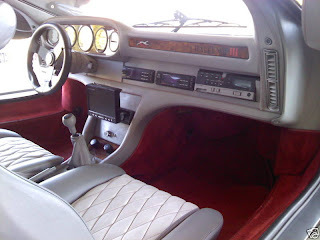 4 seater with a Carrera 2 engine was built. This is that car. The eBay listing for this car is not very clear. There are pictures of several Sbarro cars and it's a bit confusing as to which one is for sale. I'd like to write more about Sbarro and his designs, but I don't know a whole lot. I'm sort of learning as I write this. 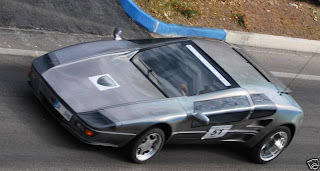 Franco Sbarro - Another visiosn of a car is a good place to start if you're as curious about this man and his designs as I am. The car for sale is located in "la ñora - Murcia, Spain". Click here to see the eBay lsiting. Sbarro cars remind me of those crazy and impractical outfits only seen on fashion show runways. If Lady Gaga and Bjork got together and designed an automobile, it would resemble a Sbarro. I'm sure Sbarro howls with laughter when his insane creations steal the limelight from serious builders at car shows. Just type in the name Sbarro in "Google News" and check out the reaction to the Autobau. 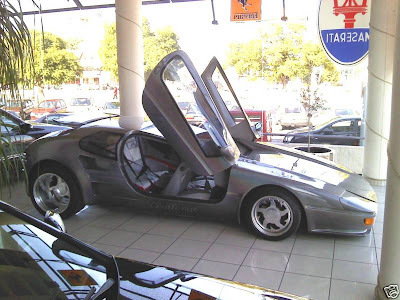 I was going to email you this car last night as found it while browsing the addictive "Others" section on eBay. I know your a fan of wedges, this is taking it to an all new level. It looks quite roomy in the rear of the car with the passengers sitting higher than the driver in a laid back position. Integrated backup camera is ahead of its time. I agree with Jon, Sbarro must have a sense of humor, the things he comes up with! Didn't he invent the center-less wheel then went on to invent the wheel with an engine in the center? I forgot all about the story of Sbarro and the burned GT40 scandal. Google "Sbarro," "auction," and "GT40." It appears that there is another side to Sbarro that has resulted in lawsuits and controversy.